(CNN) -- UEFA have charged Chelsea, along with players Dider Drogba and Jose Boswinga, after the controversial scenes which followed their Champions League semifinal exit to Barcelona. 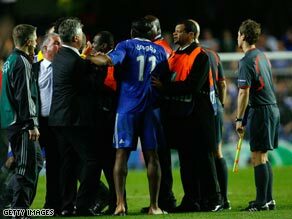 Drogba is held back by stewards at the end of Chelsea's controversial Champions League exit. Drogba faces a misconduct charge for confronting referee Tom Henning Ovrebo after the final whistle, while Boswinga gave a controversial interview in which he criticized the referee in strong terms. Chelsea have also been charged with failing to control their players and fans, who threw objects on to the pitch at Stamford Bridge. The May 6 clash ended 1-1, with Barcelona going through on the away goals rule, as Ovrebo turned down a series of strong penalty appeals for the home side. Worse was to come on the final whistle when Ivory Coast international Drogba, who had been substituted in the second half, appeared from the tunnel to confront the Norwegian official. The following day, wing-back Bosingwa laid the blame for the Blues' failure to reach their second successive final squarely at Henning's feet. "I don't know if he's a referee or a thief," Bosingwa told Portuguese television station RTP. "I don't have any words to describe that man that was on the pitch "We have nothing against Barcelona's goal but the penalties that he didn't give us and his way of managing the game weren't right at all. "This referee should never referee a game again. What happened was a disgrace. It was a well contested game but the referee came to spoil our game." UEFA's disciplinary panel will hear the cases on June 17. They could ban both players from next season's Champions League and make Chelsea play behind closed doors.